I am a huge fan of Ina Garten, The Barefoot Contessa. Her recipes and table scapes are inspirational—except for (AKKK!) the amount of fat and sugar calories. That’s the bad news. The good news is that I typically manage to tweak her recipes cutting half the fat and sugar while still preserving the great taste. 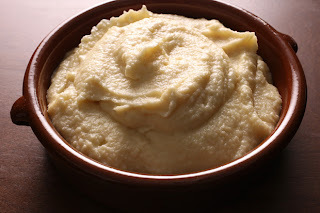 Here is one of my favorite winter root veggie healthy recipe makeovers of hers, Celery Root and Apple Puree. As Ina would say, “How easy is that”? 1. Melt the butter over medium heat in a shallow pot or large sauté pan. Add the fennel, celery root, potatoes, apples, 1½ teaspoons salt and ½ teaspoon pepper. 2. Sauté the vegetables, stirring occasionally, until they begin to soften, about 4 to 5 minutes. Add the cider and tightly cover the pot. Simmer over low heat (I pull the pot halfway off the heat) for 30 to 40 minutes, stirring occasionally, until the vegetables are very soft. If the vegetables begin to burn or they seem dry, add another few tablespoons of apple cider or some water. 3. When the vegetables are cooked, add the milk and cook for 1 more minute. Transfer the mixture to a food mill fitted with the coarsest blade and process. (You can also use a food processor but the texture will be smoother than with the food mill.) Taste for salt and pepper and return to the pot to keep warm. Serve warm. Serves 8-10. Serving Size: ½ cup. For more healthy recipe makeovers that will cut calories without losing the taste, join my free Make Healthy A Lifestyle Blog at LindaLaRue.com. If your goal is to get fit in 2012, I recommend my new Fat BURN Fusion Total Body Core Transformer Kit. FOR A LIMITED TIME ONLY: Free Shipping. Click here to order now.